HTC’s market cap has just overtaken Nokia’s. While market capitalization is a fickle thing, shifting with sentiment, this is still a remarkable feat. Nokia’s market capitalization has almost halved in the space of a year while HTC has more than tripled from $10 billion to over $33 billion. The recession was hard on everybody but HTC soared during 2010 while Nokia never recovered. Markets reward unforeseen growth and typically that means above-market growth. As Nokia’s growth lagged the market the stock was punished. As HTC’s growth exceeded the market’s growth, the stock was rewarded. HTC’s smartphone business was under-performing the market for most of 2009. In fact, it was even in negative growth for three quarters. 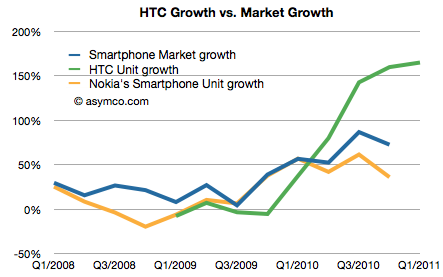 The surge in growth coincided with HTC adding Android to its portfolio and given no other changes, seems to be causal. Although not within the time range of the charts above, HTC had another period of rapid growth in the mid 2000s. A year ago HTC was making excuses and apologizing. Today they are more valuable than the largest phone vendors. All thanks to Android. But why no thanks to Microsoft? HTC was the primary Windows Mobile vendor a few years ago. They claimed at one point to have shipped over 80% of all Windows Mobile devices. They were also the leader in the Pocket PC franchise as they were the ODM behind the iPaq brand from HP/Compaq. HTC would not exist today were it not for Microsoft. The relationship is such that HTC is paying Microsoft for protection from (potential) Android IP infringements. HTC has also licensed Windows Phone though the relationship between Nokia and Microsoft must give them pause. But that’s the whole problem. Those who live by the sword shall die by it. HTC was a Microsoft dependent and now they’re a Google dependent. As the basis of innovation shifted, HTC was agile enough to make the transition. Perhaps they can execute a portfolio switch yet again as their upstream suppliers change whims or business models. But then again, as we saw with Windows Phone, perhaps not. If HTC wants to control its destiny it needs to control its suppliers. Now that its power and brand have grown, it needs software because in their market software is self-determination.